Freshman Sesha Bell sings an original song. On Friday night, Apr. 29, students gathered in the Mead Witter room of the Warch Campus Center to watch LU Underground, an open-mic hosted by Students of Lawrence (SOL) Studios. MCing the event were SOL Studios president junior Daniel Green and vice president junior Wasonu “Frog” Allen. Freshman Grace Reyes kicked off the evening with two vocal covers: Cher’s “Bang Bang (My Baby Shot Me Down),” and “Sunflower” by Rex Orange County, accompanied respectively by her guitar and ukulele. Reyes’ voice was delicate yet powerful, her range expansive and emotional—a wonderful opener for what would largely be a show of vulnerable performances. Up next was freshman Sesha Bell, performing as Sesha Grace, who gave the audience the privilege of being the first to hear her latest original song. Bell plucked the strings of her guitar in a folksy rhythm, ending each circulation of chords with an understated riff. Her lyrics tended towards metaphors involving animals (“You were the vulture while I was the quail;” “Everyone knows the quickest way to the honey is killing the bee”), resulting in a dulcet yet clever tune. A drastic tonal shift happened when freshman Quin Giglio hopped onstage. Green introduced him by saying, “I’m not really sure what Quin’s gonna do, but I guess he knows what he’s gonna do.” Without another word, Giglio began hamboning like it was the only thing that could save him. Cheers erupted from the audience as the performance intensified, feet stomping so hard the vibrations knocked over the floor tom-tom drum that shared the stage. The types of performances continued to expand with senior Jacques Fehr, who rapped over various backing tracks, followed by freshman Hyland Flores who read a potent original poem with themes of prayer and heartbreak. Green then took his turn onstage, rapping an original called “Don’t Go,” which he said he was really shy about. Allen retorted into the mic, “Don’t let him be shy!” at which the audience applauded Green in encouragement. Sitting on a stool and kicking his feet back and forth, Green rapped and sang with obvious honesty and talent. Upon finishing, he said, “I had my eyes closed the whole time,” which evoked a laugh from the crowd. Next, juniors Sebastian Roman on saxophone, Matthew Wronski on bass and Green on drums geared up for the wildest performance of the night: a math rock piece with a ridiculously long title which Roman apparently made up on the spot, referencing Thelonius Monk and Charlie Parker. Wronski and Green set the vibe of the song in a two-minute long intro before Roman joined them. As they progressed, Roman went into his own world, eyes shut, his fingers flying up and down the keys. Wronski and Green maintained eye contact, amazingly in-sync with one another, both sporting grins and bouncing along with their instruments. Their ten-minute performance won the attention of passerby, and by the end, a wall of onlookers had formed just outside the room; their talent was genuinely awe-inspiring. After, Allen took the stage to rap over a backing track, giving the introduction, “This song is about some tough times. I haven’t performed [it] ever.” Though the full meaning in the lyrics was difficult to grasp upon a first hearing, it was easy to sense the melancholy emotions in Allen’s voice. In contrast, his second song, “Wind It Up for Me,” was upbeat and very catchy. Freshman George Medina followed, rapping two original songs over a beat and singing a cover of “Ain’t No Sunshine” by Bill Withers, which showcased his incredible falsetto and vocal range. 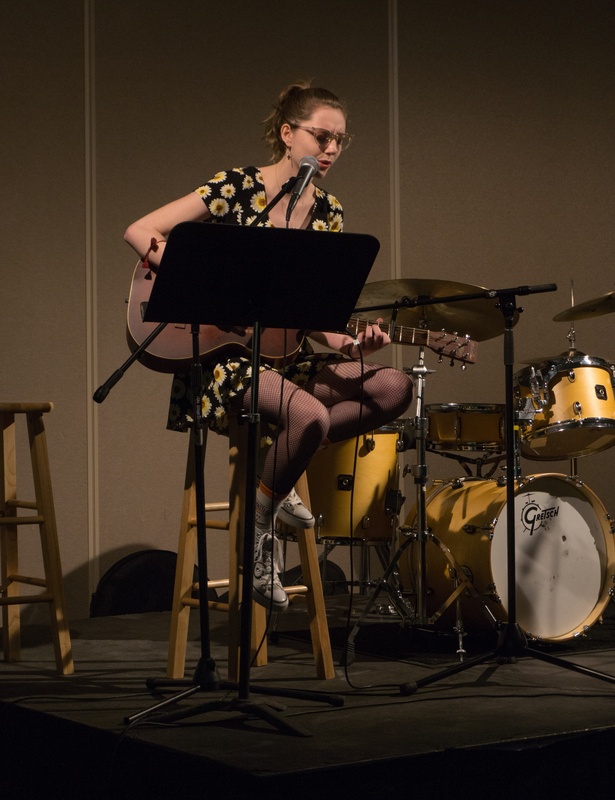 After Medina, freshman Clara Baker read an original poem, junior Mike Ganz rapped and the duo Awake For Birds, comprised of juniors Lizzy Lynch and Erin Alanna, performed two original songs. Closing out the night was freshman Josh Canales Garcia who read two original poems. The first was a unique look at his god; Garcia wrote as if his god was more human than religions tend to make Him out to be, asking questions like, “Would you give Him meds? Would you watch Him drink the pain away?” The second was a beautifully nostalgic poem about the significance of Garcia’s grandmother’s house throughout his life. All the participating students had undeniable talent. The various open mics that happen at Lawrence throughout the year are a fun way to discover friends’ secret skills, support fellow students and showcase one’s own abilities, and it is always worth checking them out.